Expect a warm welcome at the Waterfront Wynyard. 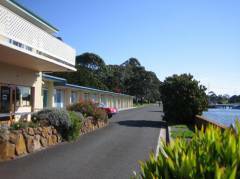 Situated on the banks of the Inglis River in Wynyard, this well appointed motel will keep you coming back for more. All rooms have team and coffee making facilities, Cable Television, fast ADSL broadband internet and all the views you can handle. Relax by the fire in the guest lounge area and read a good book from the guest library. The onsite restaurant prides itself on sourcing the best local produce to give you an everlasting taste of Tassie at its best! For work of pleasure, you'll be back to stay at the Waterfront, where the only thing overlooked is the water.